Personally, i 'd like to ask how would you rate young generation nowadays? I would dare to say young ones are more expressive towards their loved ones. Just this evening 8pm after visting my friend in NUH Hospital, I took a MRT train back to Lakeside from Dover Mrt Station. As per normal practice while desperately trying to find for myself a good seat (as I'm alrdy having white hairs, legs breaking and gonna approaching senior citizen status very soon), I couldn't believe my eyes that one of the reserved seats is taken up by 2 commuters. Neither are they pretending to doze off , nor are they violating any laws by eating or drinking on the Mrt train. Upon closer examination, they are a pair of young loving couples perhaps in their early twenties doing something out of the ordinary in the reserved seat. Guess what they did openly in the public? They are busy "making-out" in front of quite a number of passengers. 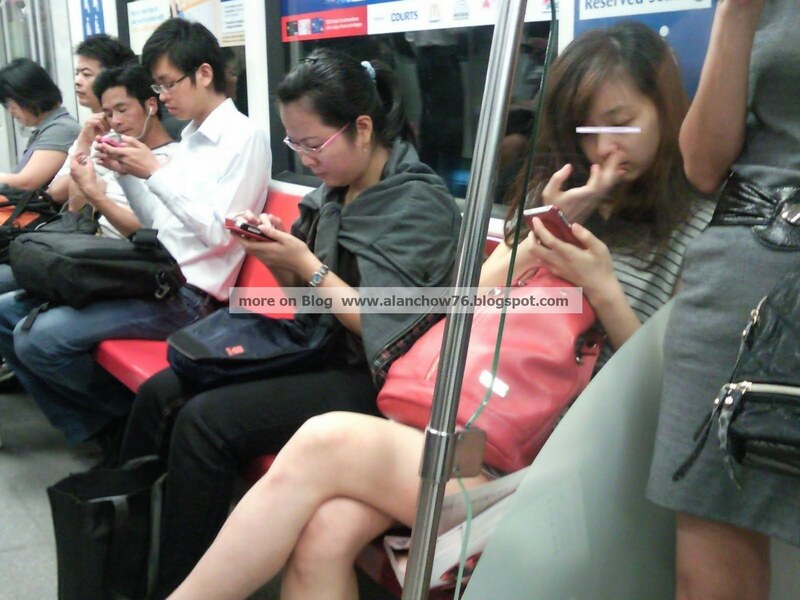 They seem to be very engrossed in their affairs without considering the feelings of other passengers in the train. The young girl was seen by all passengers 'buka' her legs wide open not for the boyfriend to sit on but for him to advance towards in order for her to hug onto his body. They are indeed a pair of love birds! Can't get off each others' presence , very sticky thru' out the journey. After abt 5mins when the boyfriend got down at Clementi Mrt Station, she keeps on gazing at her boyfriend at the platform as if they are gonna to be seperated for a very long time. Then, this girl is seen digging her nose and sucking her fingers...n gazing at her mobile phone. oh no. I wonder why happen to this generation? I noticed there's this 1 Bangla man who was sitting opposite this couple, paying his close attention to their itimate behavior and seem to be enjoying this PG drama judging by his wide opening and beaming eyes. Fortunately, there are no little children or young ones around. How would they react or worse would they imitate this type of behaviour which is meant for only couples? As the saying goes: Monkey See Monkey Do. Who knows they may start to apply what they learn by themselves... gosh! pls consider feelings for an "old man" like me. At least pls give up your seats before you get itimate. But pc of advice : make sure no young ones around, yeah. Thanks and no thanks. Leg pain , aching again gtg for my GoYo medication.